Above: Rural Heritage April-May 2019 Cover: Chris Mosher competes with his Belgian team at the 2018 US Plowing Contest. consult our online Draft Dictionary. Joe talks about his Facebook usage and a couple of good groups to follow, spring in the Midwest and his upcoming travels to Samson Harness Shop, Wooly Wagons and the Country Living Workshop at Lehmans for the magazine as well as Rural Heritage on RFD-TV. Vintage photos of rural life by renouned photographer JC Allen including photos of tapping maples in Indiana, blasting tree stumps, a boy with his pony and a bird feeder project. Stacy Lyn Harris shares her recipe for cucumber salad. We can almost taste summer! 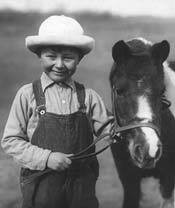 Gordon Myers with his pony. 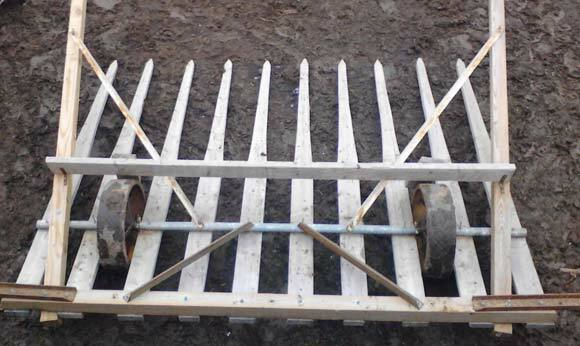 Overhead view of a homemade buckrake. Revisiting the Buck Rake− − − click on title to read this story in full. Ken Gies makes a buck rake with a side hitch from off-the-shelf materials. He explains his choices, design and assembly and includes many detailed photos. 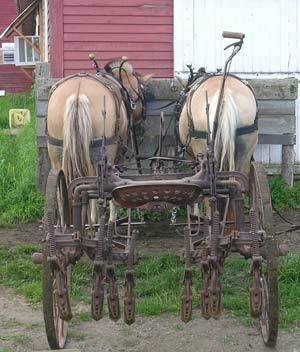 This is a great DIY horsedrawn implement. Market gardeners Anne and Eric Nordell explain their use of horse manure compost and rock minerals to improve soil fertility. They explain in detail how and why they do this, incorporating results from soil testing and addition of minerals. Eric Nordell spreading compost, soft rock phosphate, Azomite, high mag lime, Physiostart and peanut meal on his market garden field. 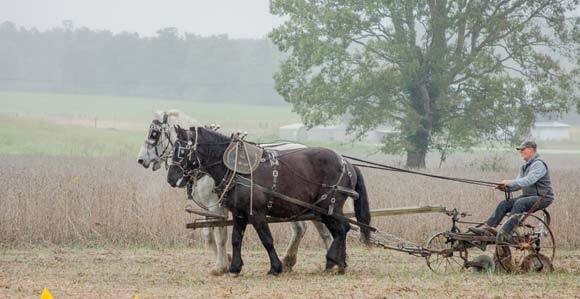 Horse powered farmer Stephen Leslie walks through the process of developing a business plan. From capital and production costs to land cost, crop choice, budget, taxes, labor, insurance and more. There are many resources listed to help you in developing your own plan. You can start with good, used equipment instead of new in your live power business plan. This ghost town was once a stop on Southern Pacific Railroad’s route west. Water wells, copper mining, and the Butterfield mail route all flourished there when Jenifer Morrissey’s great-great-grandparents purchased land in 1914. She has included some wonderful vintage photos to enhance the essay. Jerry Hicks tells a wonderful story about tapping maples when he was 16 with the help of his Pappaw and Mammaw. You can almost taste the syrup while you are reading. Horselogger Taylor Johnson tells us what he loves about horses, Fjords and Cobs in particular. He links his preference in horses to his heritage – gypsy stock in the United Kingdom. This is the first article in a series about traveling to the UK and the Gypsy Cob breed of horse. Follow along as Ralph Rice instructs us on building a small dump wagon. He uses Kari Moulton’s design, with his own twist, to make this extremely useful horsedrawn wagon. The history of draft animal power (both horse and oxen) before WWII by family farmers as discussed by Tim Huppe consisted of farming, logging, competitions, shows, pulls. Tim then tells about Sanborn Mills in New Hampshire where they focus on training teams and teamsters in the historical working farm setting. He gives us a overview of the particular work their teams do at the farm. Modified harness making it easier to attach. Leroy Keim is 71 years young and farms with a single horse. Read how he modified its harness to make it easier for him to be able to put it on in pieces. He also tells us of his stable management method to perfect the manure composting process on his farmland. Jenifer Morrissey shares Richard Augeri’s love for ponies and their role on his Vermont farm. He uses four grade ponies and one Shetland stallion to bring in hay, plow and log his woods. Richard has adapted many horsepowered implements to fit these small draft animals. Restorative forestry was taught, practiced and demonstrated at the Biological Woodsmen’s Week at Berea College in Kentucky. Teams of horses along with teamsters and timber cutters teamed up removing the “worst first” trees from the college’s acreage. Klaus Karbaumer speaks to breed associations about maintaining and promoting the traditional draft horse conformation. Encouraging the associations to have guidelines about what the breed should be, independent of market demand. 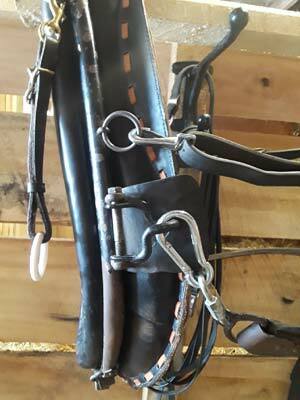 Conformation, use of artificially enlarged hooves and forcing hitch horses to be up-headed are some of his issues. Three week old Belgian twins thriving at home. 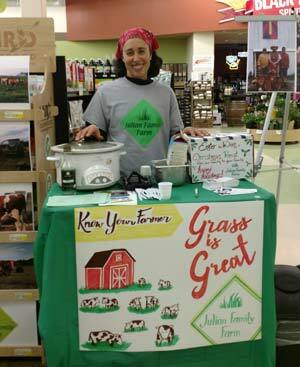 Katrina Julian discusses the need for diversification and new income streams to keep a family farm profitable. Along with their dairy, horse logging, writing and photography, she and her family now sell their beef directly to consumers. Read about the entire process from breeding to the grocery store shelf. Karen Kirsch reports on the sixth annual Donkey Welfare Symposium for both professionals and enthusiasts. Some topics discussed were: the state of donkeys in developing countries, hoof lesions, ophthalmology, tropical diseases, some history, racing mules, riding donkeys, wild donkey sanctuary and BLM management of wild donkeys. So much was covered in three short days. Ralph Rice introduces (or reintroduces) us to this old lumber industry tool and explains its many uses today, whether old or shiny new. He also tells us how he made his own tool in his shop, modifying an old axe head. A photo essay of the 14th annual US Horse and Mule Plowing Contest in Olympia, Kentucky. Competition classes included walking plow, two horse sulky plow, three horse sulky plow, antique plow and novice class. Mike McCormick with his Percheron team won the Two Horse Sulky Class at the US Plowing Contest. The Reading Room is updated with each new issue. If you wish to be notified by email when new contents are posted, please Contact Us. If you wish to receive Rural Heritage in your mailbox every other month, please Subscribe.